Update: it's hard to believe, but Tessa has an adoption in progress. A woman who had a dog with the same health issues is going to adopt her! Woo Hoo! We are still doing a fund raiser for Tessa as her latest tests were very expensive. 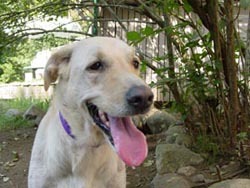 Tessa is a young purebred yellow lab who was given up by her owner because of her history with skin problems resulting from allergies. They worked with a vet who never told them about the corn allergies to which labs are prone and she was on a corn-based diet. She may have some other allergies as well, but we're working to figure out a diet that works well for her. We're looking for a forever home for her where the owner will keep a close eye on her and keep her on the diet that works for her. She is such a sweet Lab who just loves to play and romp. She's not overly physical with people because being held makes her scratch right now, but she has a sweet disposition and loves people. Just being in the same room with you or lying at your feet makes her a very content dog. She's completely housetrained, with no destructive behavior and no counter surfing or going into the trash. She stays near you when you are outdoors and just loves to play ball. She also loves playing with her foster mom's dogs, and does not seem to be dog or cat aggressive. She does have some separation anxiety issues though, and would probably do best in a home with people around who'll give her the love and attention she craves. 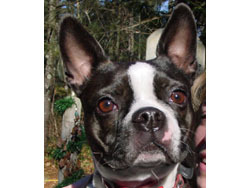 Bella is an adorable two year old female Boston Terrier. She is friendly, joyful, and great with cats. She was raised as an only dog so would probably be happiest as an only. She is not good with small children as she came from a household with 3 little ones and became very snappy with them. So if children are in your future, it's best to forego the chance that she would be displaced again. An adult home with older teens should be fine. 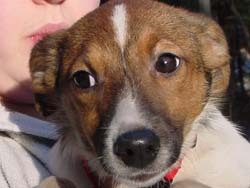 She is a delightful little dog who deserves a forever home. She is spayed and up to date on vaccines and has no health issues at all. She is also completely house trained. 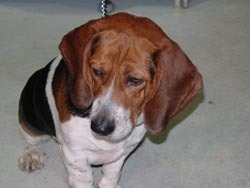 Pearl is a gorgeous one year old female beagle with a beautiful coat and rich colored fur. She looks beagle/bassett, but is registered as a beagle. 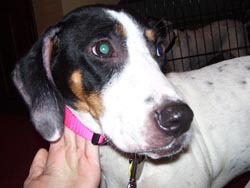 She is playful, safe with kids, and extremely gentle. She came from a breeder who raises field trial dogs and she didn't make the cut. She would be a nice family dog, though. She is soft and gentle and very lovable. 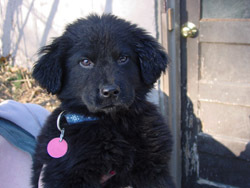 Pearl is being fostered in the Natick area and you can meet her once we receive your application. She is 99% house trained. This litter of pups appears to be Border Collies with possibly Dalmation or some sporting breed. They were living outside in the cold in WV. They are extremely friendly, outgoing, and curious. They are 12 weeks old, 3 females and 1 male. They are all nice, quiet, easy going puppies. 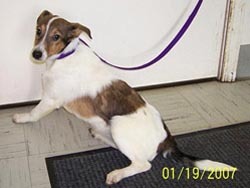 We will show them on Wednesday, Feb 7th, at Especially for Pets in Wayland from 5:30-7:30 PM. Fill out your application online under the link "How to Adopt" and we will have your printed application at our Meet and Greet. 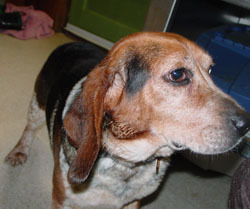 Sheila Beagle is a gorgeous 3 year old female beagle who is great with cats and kids. She has the richest coloring and ticking you can imagine. She is a very soft, sweet beagle with an excellent temperament. She would be fine with young children and also great as a friend for another dog. She crates well and loves to sniff around the yard. She will play for hours outside, but is very quiet and gentle inside. She will be spayed on 2/5/07 and ready after a short recovery in her foster home. Artemus is a large breed puppy who is thought to be St. Bernard or Great Dane puppy. Now that he is here, he looks more Dane than Saint Bernard. He has the Dane feet and other features. He is going to be a big boy. He already knows how to sit and he comes when called, but he is going through the teething stage so he is a bit too mouthy for small children. He will need puppy kindergarten right away and continuous training using positive reinforcement techniques, such as clicker training. 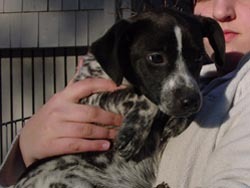 Aussie is one of a litter of Pointer/Aussue mix puppies and she appears to be most like a German Short-haired Pointer, in her coloring and markings. She is very sweet and cuddly. She currently has a little cough so we will not be relasing her until that clears up, but we will accept and review applications for her. 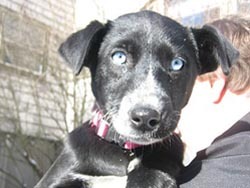 Lucinda is one of a litter of Lab mix puppies have long hair and have some black spots on their tongues. They are about 10 weeks old and are originally from a humane society in Indiana. Lucinda has an adoption pending with a repeat adopter, but we have her siblings, Kallie and Tony, coming on March 2nd and another litter of lab puppies coming on 2/24/07. Applications will be reviewed as they come in. Lucy and her sibling, Kermit, were rescued from a hoarder in VT and brought to a shelter in MA where they were very scared and wouldn't eat. We now have them in a foster home and you would never know they had a shy bone in their wiggly bodies. Lucy is friendly, playful, crazy at times, and a lot of fun. She was recently spayed. 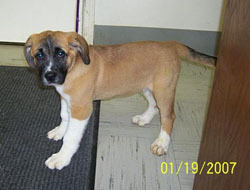 Please come meet her at our Meet and Greet on Saturday 2/25/07 at Petco Natick from 10 AM to noon. Samantha is one of three Sheltie puppies. These sheltie mix pups were born 9/29/06 so they're just a little over four months old. They weigh about 15-20 lbs each. She currently has a little cough so we will not be relasing her until that clears up, but we will accept and review applications for her. Samantha is the smallest of the three Sheltie mix puppies. These sheltie mix pups were born 9/29/06 so they're just a little over four months old. They weigh about 15-20 lbs each. They will be Sheltie size as adults. She currently has a little cough so we will not be relasing her until that clears up, but we will accept and review applications for her. 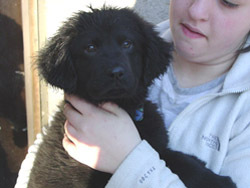 Tommy is one of a litter of Lab mix puppies have long hair and have some black spots on their tongues. They are about 10 weeks old and are originally from a humane society in Indiana. Tommy has an adoption pending, but we have his littermates, Tony and Kallie, coming on March 2nd and another litter of lab puppies coming on 2/24/07. Applications will be reviewed as they come in.